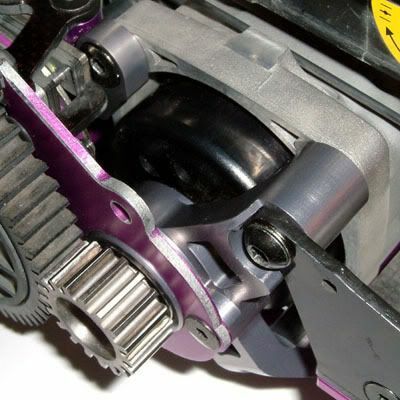 Vertigo Performance has another 1st in aftermarket for the HPI Baja. Along with being the first with carbon, carbon brakes, Rear hub carriers and machined aluminium calipers we have now released an aluminium CB carrier that should should allow your stock CB to rotate truer and aftermarket CB's run absolutley true. We will be offering our Carrier with the smaller rear end mount also in matching pewter coloured aluminium as part of the kit. Feel free to share this photo with the world! I want that piece sooooo bad!! Thanks BTW for the compliments! Love the look of that peice. Would hate to cover it up, would want to leave side panels off just to show everyone what is under there. That little part would retail about $70.00 Very pricey because it is milled from solid billet. We can change the design but the looks wouldn't be there..
Will draw one up when we get a chance and post it. $ 70.00....sold! When can I get one? I agree where do I sign up. If Clayton sells it you know its good. Every Vertigo part is amazing. I have my name on one too! Amazing part! If Clayton sells it you know its good.